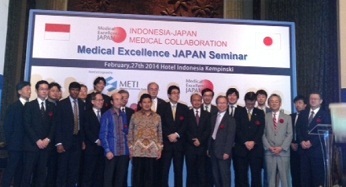 A seminar was held by Medical Excellence JAPAN (MEJ) in Jakarta, Indonesia on February 27, 2014 where Med in Japan presented on its activities as a medical coordinating service provider for foreign patients, and also held a booth to introduce partnering medical institutions. Dr. Akmar Taher, the Director General for Health, Ministry of Health was present along with more than 160 doctors and participants from the Indonesian healthcare sector. From Japan, Mr. Junji Shimada, Minister of the Embassy of Japan to Indonesia, Mr. Makio Uchida, Director of MEJ, Dr. Koichi Tanaka, Professor Emeritus of Kyoto University, Dr. Katsuyuki Karasawa, Director of Radiation Oncology, Komagome Hospital, Dr. Yoshinori Morita, Kobe University Hospital, Department of Gastroenterology, and twelve MEJ member companies including EAJ (Med in Japan) participated in the event, totaling more than 200 persons. Following the main seminar, a workshop was held where Med in Japan presented on our services for foreign patients seeking treatment in Japan. We highlighted one of our Indonesian cases to emphasize our experience with the patients from the country, and worked to improve awareness of treatment opportunities in Japan. Med in Japan will continue to work actively to promote our services in south-eastern Asia, one of our major markets.